Summary: Could you survive on your own, in the wild, with every one out to make sure you don't live to see the morning? My Thoughts: Wow, what a book. I'm one of the people who jumped on the Hunger Games train very late. I read this book on September 1st, 2010 which is a long time after it was released. It had the dystopian feel to it so I was unsure about reading it since I'm usually not too into those types. I was so afraid I would be let down after all the hype building up about these books. 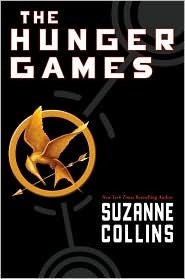 I was so surprised how much I loved The Hunger Games! We meet Katniss who is truly an inspiration for girls everywhere. She's so strong, determined, sincere, and has a big heart even though she has to be tough. She is best friends with Gale, who goes hunting with her. We don't get much info on Gale, just that he has a big family and he is the sole provider for his family. We meet Katniss's mother and sister Prim. Prim is just 12 years old. Katniss comes from a very poor family and she hunts illegally to feed her family and trades just to keep them going day to day. The Hunger Games take place every year. One boy and one girl between the ages of twelve and eighteen are called upon to participate in the annual Hunger Games, a fight to the death on live TV. Of course that year, Katniss is worried that her or Gale's name will be called because they have their names so many times in the draw. But, unfortunately her sister is called and Katniss stands up and volunteers to take her place. She can't imagine her sister making it, or having to try to survive. She can't see her sister go through that. Another boy is called, Peeta. What can I say about Peeta? He's pretty awesome to me. Katniss is vaguely familiar with Peeta, they sure don't hang out with each other and she's just glad it wasn't Gale. Anyways, they go to get ready for The Hunger Games, and the small interactions between Peeta and Katniss were nice especially when it would dawn on her, she needs to stay away from him since he's basically the enemy. The talent section where she shows them how she can shoot a bow and arrow cracked me up! I actually reread that passage a few times! They go onto The Hunger Games. It starts out simple enough with supplies out in the open and players going after what they want. And, some of the participates band together which is just pointless since only one can walk away the champion. The things they have to endure are painful to watch, painful to feel. I don't want to give away the whole book. Lets just put it this way, The Hunger Games is wonderful. The trials Katniss has to go through and she never gives up no matter what. She knows back home there are people waiting for her and she must defeat this! She must win. Peeta was likable at the beginning and by the end I really really really loved him. There has been so much talk about Team Gale and Team Peeta and I guess I do like Gale but I just don't feel much of a connection to him at this point (maybe because he wasn't in book 1 much) and Peeta just made me fall for him. The things he said, his personality, it was all there. Katniss is still brave and I am glad we saw things through her point of view. I really liked a lot of the characters. I really liked Rue. I didn't like Foxface very much. She just annoyed me I guess. The characters are likable, the plot is wonderful, the suspense was awesome, and I found myself happy, sad, crying, mad, hurt, and wanting to throw up throughout the book! Not many books make me feel all those emotions! In other words, hands down it was one of the best books I've ever read! Overall: I loved loved loved loved this book! Way to go Collins for making me fall in love with this novel because not many books like this do! I started reading this and finished it within a day, I kept telling myself every time I needed to set it down, just a few more chapters than I'll stop! Well, I didn't stop too often! It was so addicting! Cover: Like it, its simple but neat. Warning! This series can be seriously addictive! I am so glad you enjoyed it. It has to be one of my favorites. Yes, I was late to the game as well. I can't wait for the movie. I hope it actually gets made. Lovely review.